I am a Sister of the Sacred Hearts of Jesus and Mary (Chigwell Sisters). 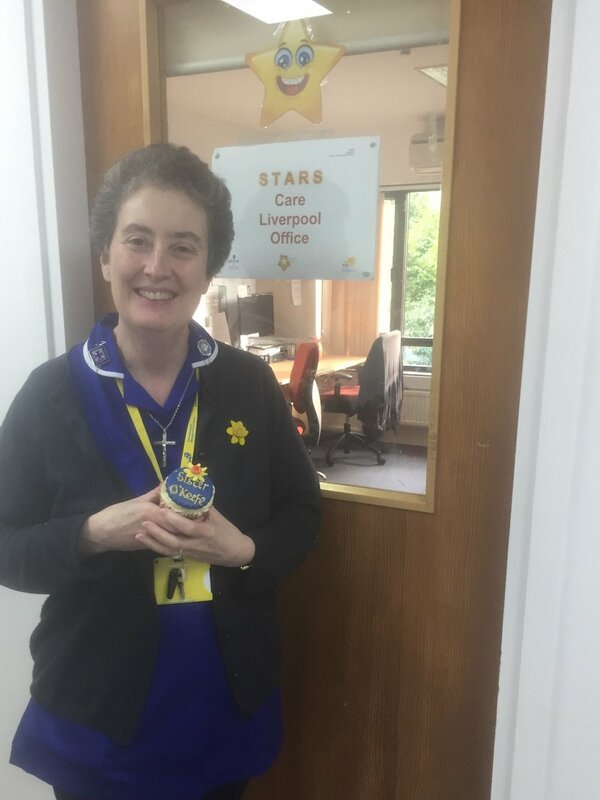 I live in Liverpool and work part-time as a Marie Curie STARS nurse providing palliative care to terminally ill people in their own homes. We are a team of 8 nurses, 3 admin workers and a number of Carers who support people in the last 3 months of their lives who wish to live out these precious days in the midst of their families, in the privacy of their homes. Patients range in age from 16+. Each time a referral is placed on my desk, I try to imagine what this diagnosis of a terminal illness means for this person and their families. Some have been ill over a number of years with a chronic condition such as kidney failure, heart failure or respiratory illness. Others may have been newly diagnosed with an aggressive neurological condition or cancer. For each one and their family, it is a life changing event. Many have good family and local community support; however, a significant number live with the diverse challenges associated with poverty in all its dimensions. Some family situations are very complex where family communication has broken down and the ill person may be faced with travelling this sensitive terminal journey without the necessary social support that they need. On occasion families wish to withhold the ‘truth’ of the diagnosis or prognosis from the person. Deep discernment is needed as I try to sensitively respond to such a challenge. When speaking with the ill person alone, many tell me that they know that ‘time is running out, I am tired and I am ready to go.’ Some people struggle greatly for a period but as time goes on, become more reconciled to their dying. They may fear the impact of their going on their loved ones; family or other relationships or issues may need to be reconciled before they can ‘let go’ in peace. My day begins with personal prayer and morning Mass at the beautiful Carmelite Monastery a couple of miles from the office. I am deeply aware that I cannot do this work alone and ask for the grace to draw strength from the God of all life in the Eucharist. As I knock on family doors, I often ask for the guidance of the Holy Spirit as I have no idea what awaits me in each new home. On many occasions I am deeply humbled by the graciousness of the sick, the courage of their families and often in the midst of great loss and suffering, a sense of humour prevails. A strong team spirit offers mutual support to each one as we face the challenges of each day. As you will appreciate, the level of heartbreak that we witness could be depressing but we support each other especially through the most difficult situations. It is normal as one re-enters the office after a difficult visit to hear a colleague shout out, ‘cup of tea?’ which usually receives an affirmative response. Our occasional pizza evenings or cinema trips also help. I return home to reflect on my day, rest, pray and savour my deepening need for silence. A part-time STARS role offers me the space to continue my Spirituality and Dementia care and Pastoral Care training to other congregations and allows some time for my creative writing energies to flow. I appreciate the support of my Sacred Heart Sister family and as the evenings get longer, I look forward to the sound of bird song as I peddle my bike through a local park. FOOTNOTE: Sr Siobhan has recently written a book on loneliness. I Am With You Always includes a guide to loneliness in Scripture and a series of reflections on how loneliness is experienced across contemporary society. It offers a practical application of scripture to real life challenges and speaks to people across all strata of society. It is available from www.messenger.ie (Sacred Heart Messenger Press). Older Post"I will pray, talk about trafficking and keep my eyes open."